Payton College Prep proved to be the most difficult of CPS' 10 selective-enrollment high schools to get into this year. 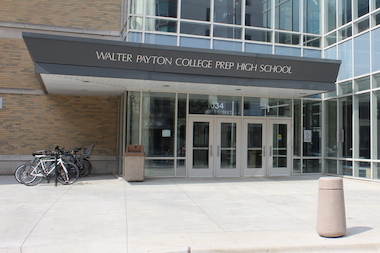 DOWNTOWN — Walter Payton College Prep was the hardest selective-enrollment high school to test into this year, data shows. The data, posted on Chicago Public Schools' website this week, comes as the district mailed out acceptance — and rejection — letters to eighth-graders around the city who sought admission to the city's 10 selective enrollment schools. The schools received 16,826 applications for 3,200 freshman slots for the fall. In letters mailed Friday, the district extended offers to 4,580 students. Last year, about two-thirds of those extended offers wound up attending one of the schools. CPS had about 3,000 slots open last year, but Mayor Rahm Emanuel has since expanded Jones College Prep and Payton College Prep. Payton College Prep was the most demanding school to get into this year, followed by Northside College Prep and Jones College Prep, the data shows. Students get into the schools in one of two ways based on academic scores. First, CPS allots spots based on a scale with a 900-point maximum, with one-third based on the selective-enrollment test, one-third on seventh-grade math and reading test scores, and one-third on seventh-grade grades in math, reading, science and social studies. For students accepted solely on those raw scores, Payton took in 69, with most scoring a perfect 900. The lowest raw point total by a student offered a spot at Payton was 898. The 84 students admitted to Northside College Prep on that basis had an average score of 898.83. The lowest score of a student accepted at Northside was 897. The average score of students offered slots at Payton was 899.68. Among that initial group of accepted students, Jones College Prep had a mean of 894.18, Whitney Young 892.84, Lane Tech 875.07, Brooks 828.62, Lindblom 812.78, Westinghouse 807.93, King 753 and South Shore 744.12. Yet, according to Grace Lee Sawin, founder of the Chicago School GPS consulting firm, an increasing number of students with top scores are actually opting for Jones or Lane as their first choice ahead of the traditional "big three" of Payton, Northside and Whitney Young. "These are good schools," she said, with their own advantages in curriculum and location. And, since CPS no longer makes multiple admissions for a student, but instead makes a single assignment for each student, more students are opting for those schools earlier in the process. Sawin also tells clients to "keep an eye on Westinghouse," with its more specialized college-to-career program. "The climate is changing a little bit, so they can see the benefits of these schools," she added. "The narrative is changing." Yet there is still tough competition for the top schools, especially given the continuing attempts at affirmative action. Aside from the top scorers, the selective-enrollment schools admit students based on four tiers of economic and social criteria, since racial quotas were thrown out by a court decision years ago. The four tiers are based on a community's average family income, parental education, number of single-parent households and homeowners, prevalence of foreign languages and Illinois Standard Achievement Test scores for the census track. Most schools accept about twice as many students based on the economic and social criteria as they do strictly on the scores. And those students are equally divided among the four tiers. For instance, Payton accepted 69 on raw numbers, but 161 from tiers — 40 from each (41 for the top tier of hardship). Payton allowed a score as low as 838, Northside 804. The lowest score accepted at any selective-enrollment high school was 650 at King and South Shore. Parents and students in more affluent areas have complained about the added difficulty they face in getting into top high schools. Applications to the city's selective-enrollment high schools were actually down from last year's estimated 18,000, in part because of the expansion of International Baccalaureate, magnet and military programs at other schools. CPS also received 8,135 applications for IB programs and accepted 4,209. Some 9,246 applied to magnet high schools, with 2,203 accepted. Of 13,064 applicants for Career and Technical Education programs, 10,257 were accepted. CPS military academies accepted 1,688 of 6,306 applicants. Of the 22 IB programs, the toughest to get into was Lincoln Park, with a cutoff score of 840. The easiest were Kelly and Bogan at 435. "People are, I think, opening their eyes a little bit more because, it's true, they're forced to," Sawin said. "They have to look at other options. "The climate is changing for the positive," she added. "Families are slowly, but surely realizing there are a lot more choices out there. You just have to kind of be open to it." Those unsatisfied with their CPS assignment, however, can still push for acceptance on principal discretion beginning next week, although those have tightened up considerably since abuses based on clout were uncovered years ago. Parents and students are asked to accept assignments by March 7.